The Samur regiment of the Russian Imperial Army had a St. George banner of the m.1876 with the inscription "For the capture of (village) of Salty 9th and 14th September 1847 and for the suppression of the uprising in Dagestan in 1877". During the First World War, the regiment fought on the Caucasian front. During the Civil War, the regiment was re-established in the White Army (as well as a number of other regiments of the Imperial Army). In June 1918, General Drozdovsky's regiment captured a large number of Red Army soldiers. Of those who wished to join the Volunteer Army, the 1st Soldier's Battalion was formed, which, having distinguished himself in the battle for the village of Tikhoretskaya, was given the name of the 1st Infantry Soldier's Regiment. 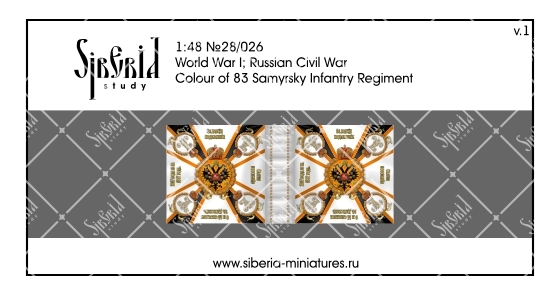 The regiment was given the banner of the 83rd Infantry Samursky Regiment, and it became known as Samursky. During the Civil War, the regiment was distinguished by black caps with a yellow band (because of the error in Osprey often depicted in reverse colors).